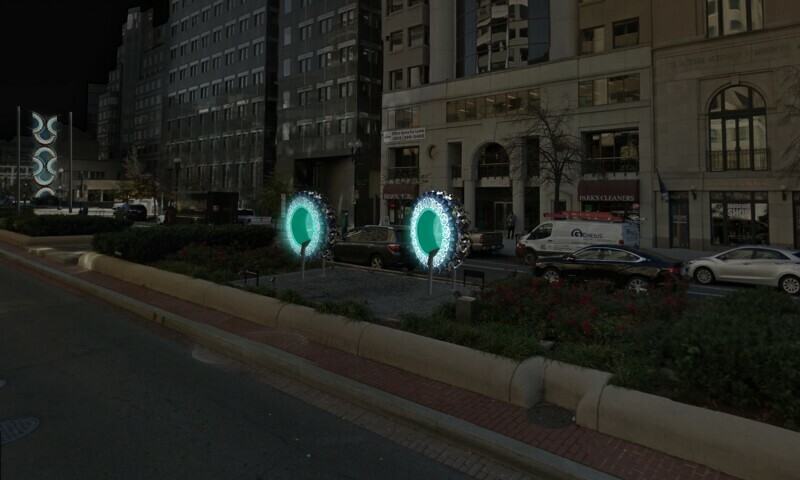 New York Avenue Sculpture Project installation rendering. The dynamic works of Mexico City-based Betsabeé Romero (b. 1963) form the next chapter in the New York Avenue Sculpture Project. To create her four sculptures developed expressly for this installation, Romero assembled carved and painted tires into totemic structures that speak to themes of human migration and the natural environment. She embraces materials and techniques relating to popular culture. Using a process similar to tattooing, she carves figures and intricate patterns into the sidewalls and treads of tires, and then fills in the motifs with gleaming metallic paint. Romero’s sculptures are the first works featured in the Sculpture Project to incorporate interior lighting, which gives each piece an otherworldly glow.